When building a new gaming rig, one has to pay attention to every detail – every component needs to be compatible with the other components and the whole thing needs to provide a satisfying performance. However, the aesthetics also play an important role here. Even though it’s not as crucial as gigabytes and gigahertz, the look of your new PC is certainly something you should take into consideration. 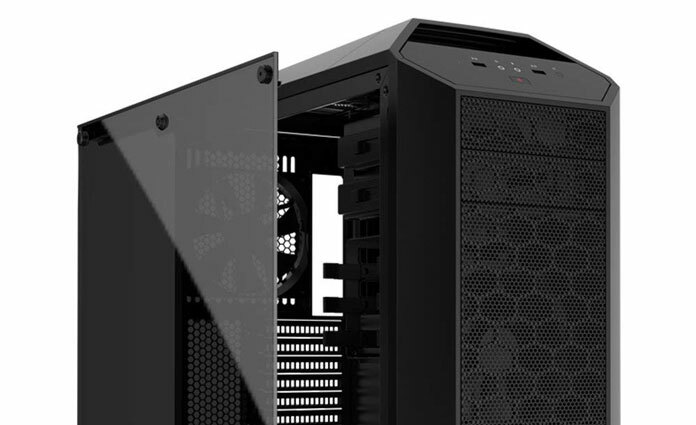 It’s no wonder that so many PC enthusiasts choose cases with transparent side panels – they allow one to make a real light show out of his chassis and show off the hardware. Typically, only one side panel is transparent on these kinds of PC enclosures, although some models are transparent from all sides – even the top one. If you have already decided to buy a chassis with a transparent side panel, another dilemma comes into play – should you go for tempered glass or acrylic (plexiglass)? Both of these materials have their own sets of advantages and disadvantages, so it can be pretty hard to choose which one to go for. Have no worries, though – we’re here to show you the benefits and flaws of each material and help you come to the ultimate decision. Read on! One of the biggest advantages of an acrylic side panel is that it’s a lot lighter than those made of glass. As you can already guess, this makes handling the panel a lot easier, and one doesn’t have to be as careful while doing so. The lower weight of an acrylic panel also significantly contributes to the overall low weight of the whole chassis. This one is a no-brainer – acrylic is a lot cheaper than the tempered glass. This makes the overall price of cases with such panels a lot lower and makes them the best choice for those looking to save as much money as possible. If you’re on a lower budget but still want to have a PC with a transparent panel, go for acrylic. Like we said, the tempered glass weighs more and can be more difficult to handle. This makes replacing one somewhat challenging while replacing an acrylic panel can be done by literally anyone. All one has to do is to unscrew the thumbscrews, replace the window, and put the thumbscrews back on. Unlike the glass, acrylic is much more susceptible to scratching damage. An accidental scratch will leave a permanent mark on your plexiglass side panel, so you’ll have to be very careful. This is quite uncommon, but can still happen – very high temperatures can change the form of plexiglass and damage its smooth surface. Even though acrylic is considered to be one of the clearest plastic materials on the market, it can’t really be compared with the full transparency of glass. A PC with this kind of a side panel won’t have any “fogginess” and will give you a very clear view of your hardware (you can see our top rated picks here). Unlike plexiglass, which can’t be anti-static treated with ease, cleaning the tempered glass is very convenient. One can simply use dust-repellent substances to keep it clean and transparent. The tempered glass is a lot more resistant to scratches, which can be of crucial importance to those PC enthusiasts who treat their PC like cars and consider that even the smallest scratches can damage the overall look. As we already mentioned, these kinds of side panels are a lot heavier, which means that transporting and replacing them requires a lot more carefulness and a full concentration. Unlike the plexiglass side panels, which, when broken, shatter into a dozen or more pieces, the glass panels will shatter into a billion of them. This can make a huge mess and it’s a lot easier to get cut. The process of manufacturing tempered glass is a lot more expensive, which, when combined with the qualities of this material, makes it quite pricey. Only you can know which material is the best choice for the side panel of your chassis – both come with their own pros and cons. As far as we’re concerned, the tempered glass wins this standoff. Even though it’s heavier and more fragile, it is also much more sophisticated and provides a much clearer view of the hardware.